Brown bagging it is a smart move for your health. Regularly packing your own lunch not only keeps portions and calories in check, but it’s a surefire way to stick to your healthy eating plan and prevent weight gain. Plus, homemade meals tend to be more nutritious than grabbing something on the fly. But it’s easy to get stuck in a sandwich rut, and when your menu gets stale, your meal won’t be as satisfying. Keep lunch interesting by adding some creative recipes to the rotation. We’ve rounded up a week’s worth of delicious options for you to try. Grab your paper bag and dig in! Black rice, aka purple rice, is a tasty alternative to white and brown varieties, and also has a higher amount of certain phytochemicals that are responsible for its rich, dark hue. Use it as the base for these vibrant vegan wraps. A colorful, folate-rich beet paste, fresh pear, and romaine lettuce pump up the nutrients and flavor for few additional calories. For a protein boost, add beans or tofu; meat lovers can still enjoy the recipe by adding grilled chicken or fish to the mix. Like salmon, tuna is a good source of omega-3 fatty acids and a popular topper for salads and sandwiches. This tuna salad wrap from In Sonnet’s Kitchen takes only 15 minutes to prep, and is guaranteed to please. 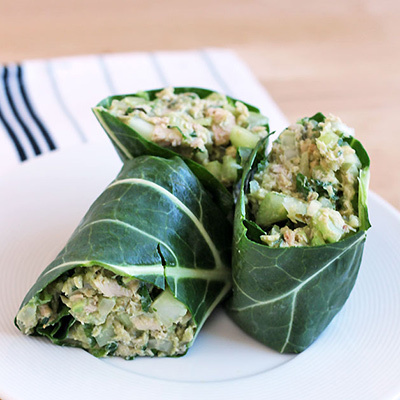 Swapping bread for a collard wrap slashes calories while keeping all of the flavor, and also adds a dose of calcium, fiber, folate, and vitamins A and C. Finish with mashed avocado for even more healthy fats and a satisfying creaminess. Looking for a portable lunch option that you can grab and take with you on-the-go? 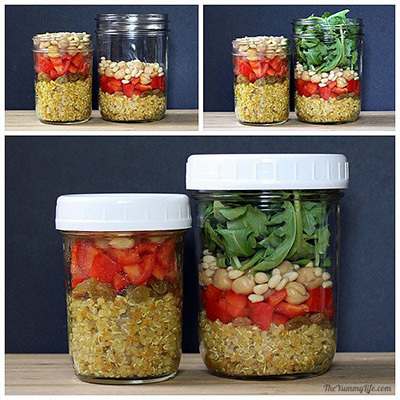 A mason jar meal is simple to assemble, easy to toss in your bag, and fun to make (and eat!). Give it a try with The Yummy Life’s quinoa salad, a fiber-rich meal that’s packed with veggies, beans, and nuts. Get creative with spices and veggies: Mixing up the ingredients in each salad is a smart way to avoid lunchtime boredom. Just be sure to pack your jar strategically to keep ingredients fresh. Start with dressing on the bottom, then add ingredients that won’t become soggy, like beans, grains, and heartier veggies (carrots, radishes, or cherry tomatoes). Continue layering the remaining veggies, packing them tightly, and finish with greens and a sprinkle of cheese or nuts. Do you hear the falafel cart calling your name come lunchtime? Skip the fried favorite and prep this baked falafel and veggie sandwich from Snixy Kitchen ahead of time. The healthier alternative is spiced with cayenne, cumin, and paprika — a flavorful combo that eliminates the need for caloric sauces. 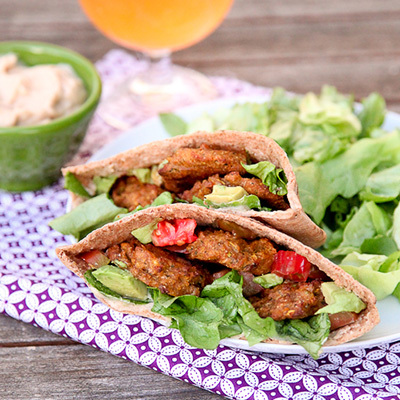 Bake up a batch of the chickpea balls on Sunday so you can quickly assemble your lunch during the week: Simply stuff whole-wheat pita pockets with the fiber-rich patties, plus veggies like zucchini, onion, lettuce, tomato, and avocado. Give the grains a break by using cruciferous vegetables like cauliflower as the base for your meal. 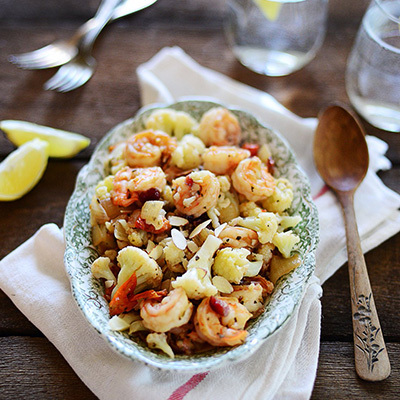 Muy Delish’s shrimp and cauliflower dish is a low-carb, low-sodium alternative to saucy fried rice or heavy pasta, and it’s just as satisfying. The shrimp provides heart-healthy protein, while toasted almonds add a satisfying crunch plus a dose of magnesium. You can make the dish in large batches and portion into containers for a lunch that feels gourmet, but takes no time out of your busy weekday schedule.